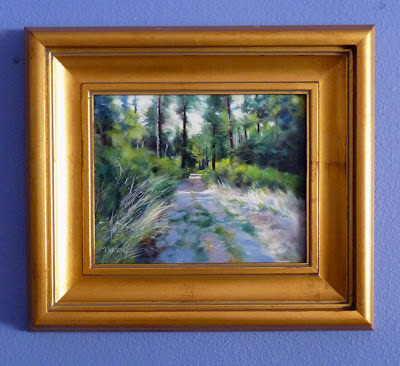 I just realized that I didn't give Oil Study 7 it's 'frame time' on this blog. It will be sold unframed but seeing it in a frame is my little goodbye ritual. Still on the easel, this oil study is coming along. 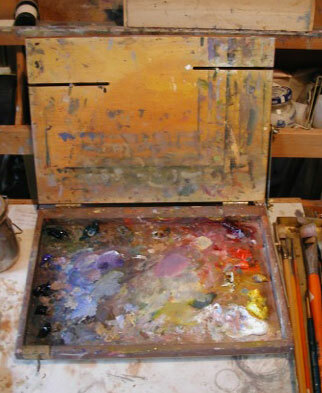 Maybe I'm turning into an oil painter because when I look at the little ribbons of oil paint on my palette, I now get the same good feeling as when looking at my pastel sticks. 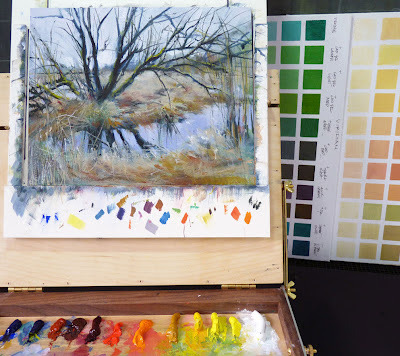 Note my Richard Schmid color charts nearby...so helpful to me! Here's what is on the easel this morning. 8 x 10 inches, oil on panel. When I found the stack of little oil still lifes, I culled the worst and called what was left the 'short stack' in my last post. I asked for votes about which one to post on DPW next and Artichokes won. 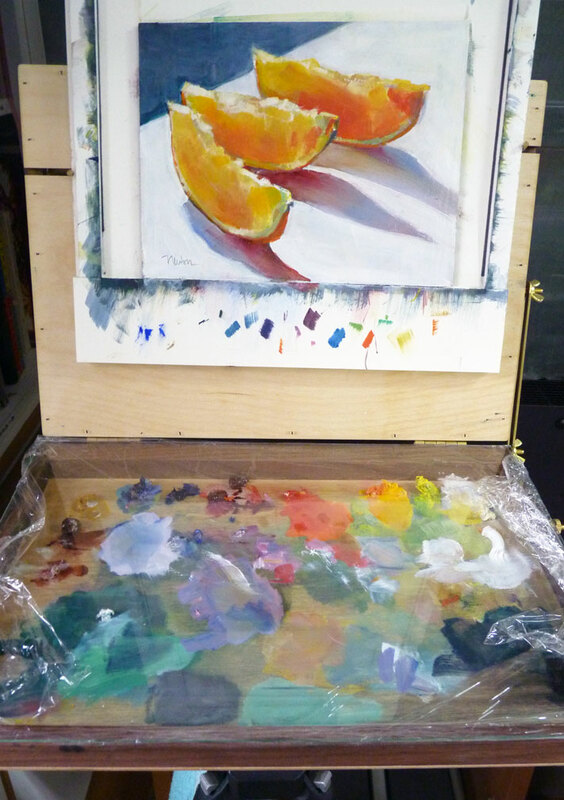 Then, I started looking at the orange slices thinking I could certainly improve on them so here they are, on my easel Saturday morning. When I worked in colored pencil, my subject was always still life. I did that for a dozen years and it was also about a dozen years ago that I changed mediums (to pastel) and began to paint landscapes. 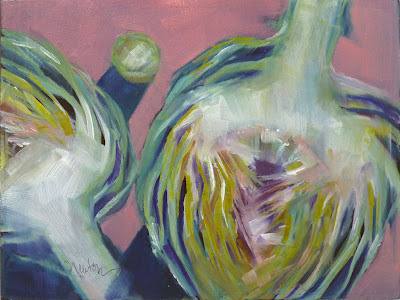 Now, here I am, painting a little still life again but this time in oil. And, I have to say, Woohoo, what fun! I may have to do more of this. 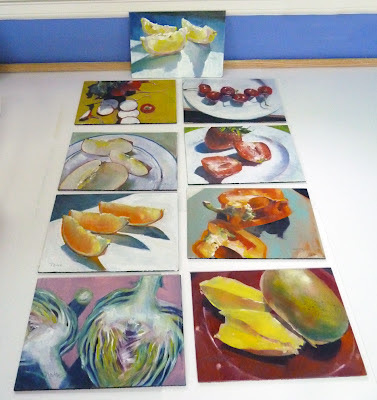 This is the short stack (the best of the whole stack) of 6x8 inch still lifes I mentioned. I'll be posting these little paintings, one each week, on the auction at Daily Paintworks. Lemon Slices is on the auction now. Which one should I post next? If anyone has an opinion, I'd love to hear it, either by a comment on this blog or by email. It is fun to see art on DPW because of the magnifier feature. 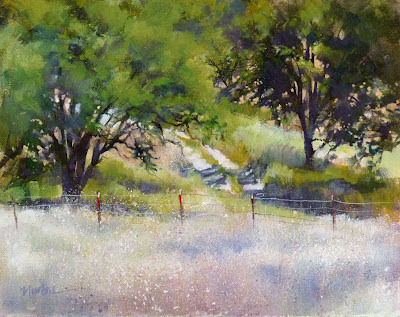 I cruise around my own and other artists' work to see the brush strokes and other details. Another "find" during my recent studio cleanup. I came across a stack of little oil still lifes. 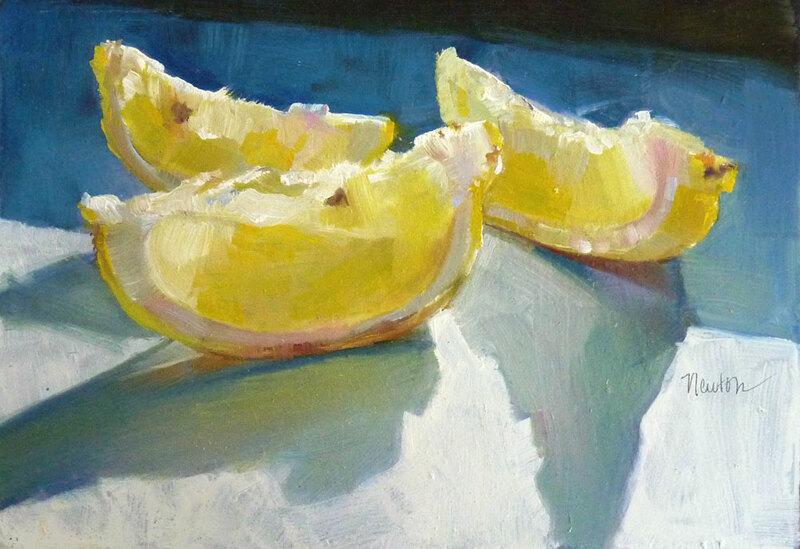 This one is 5.562 x 8 inches and was painted when I was trying to figure out what to do with a whole bag of lemons purchased at Costco. I sliced them up and froze them for glasses of water. Now I don't know what to do with this little stack of paintings so I'll post them one by one on the DPW Auction. For the past few days I've been preparing panels for more little oil studies. These 8x10 inch wood pieces are first painted on the backside with black acrylic. 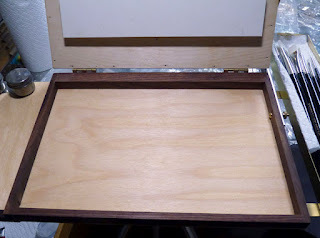 Next, I turn them right side up for two coats of white gesso applied with a sponge roller. 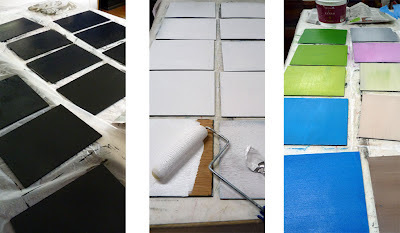 When they are dry, for the final coat of gesso I mix in acrylic paint colors to make sure I cover the entire area instead of painting white on white. I use a brush instead of a roller for this final layer. After they dry, I'll sand them lightly. A change of pace...instead of another Pacific Northwest setting, this scene is from a road trip to California last May. I like the way the fence line divides the textures and colors of this place. 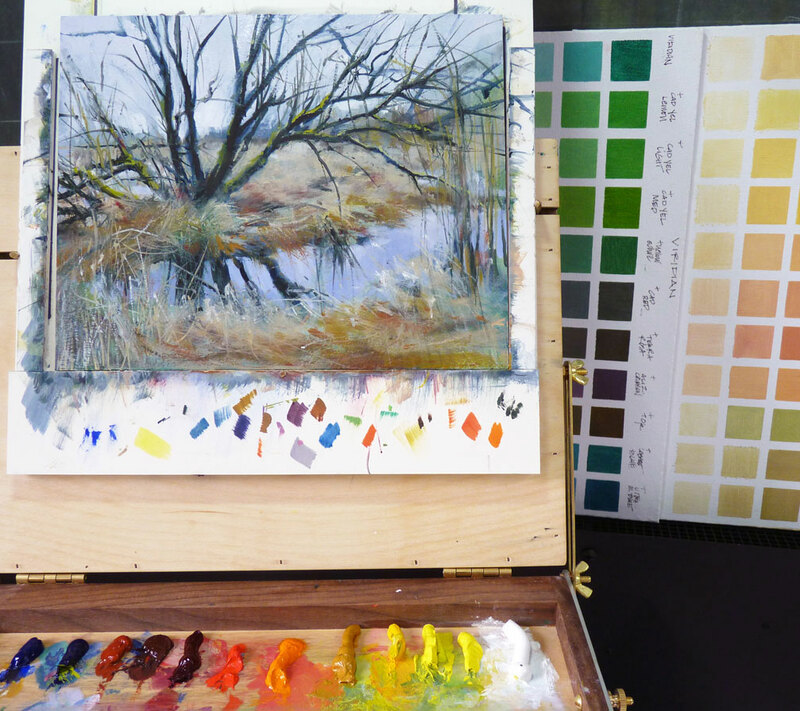 I'm enjoying working with oil paint, even the ritual of washing the brushes after each session and cleaning the palette. 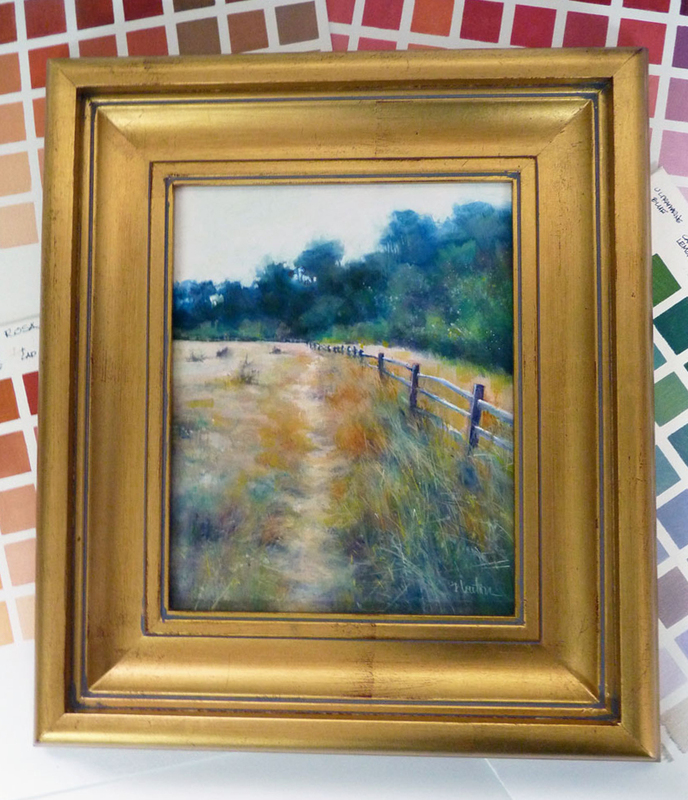 I plan to use photos of some of these oil studies for larger works in pastel. At the moment, these little studies are getting a grand reception on Daily Paintworks. I'm doing it! I'm putting paint directly on my Open Box M palette. Having a good time! 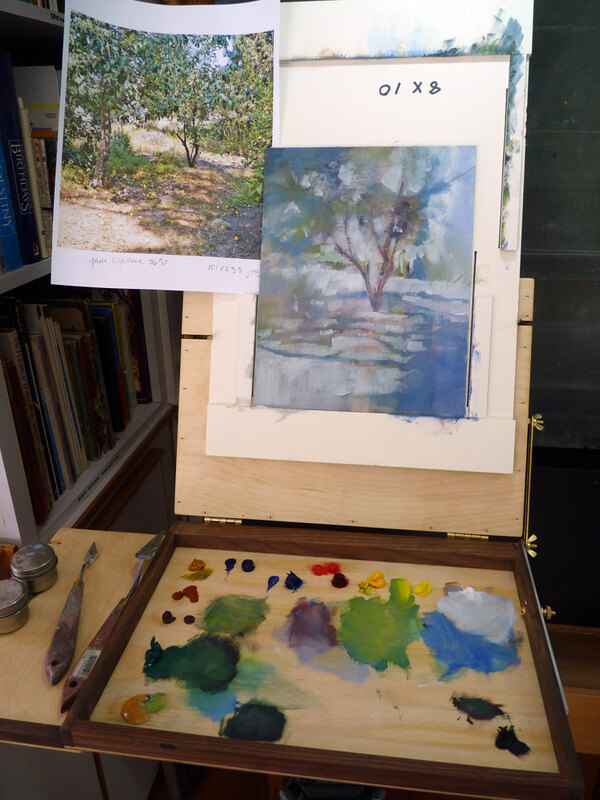 Started a painting from a reference photo of an apple tree taken a couple years ago at the Albert Handell workshop. Every time I come across this photo I want to paint it. I think the time is right for this size, this medium. I was so excited to receive my new little Open Box M panel holder last week! But I was traumatized at the thought of actually putting oil paint on the clean palette. 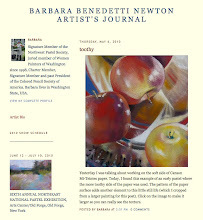 I emailed my oil painter friend, Marilyn Webberley and asked her..."REALLY? Am I really supposed to put the paint RIGHT ON THERE?" While waiting for her reply, I began to paint using a disposable palette sheet - another item that I found in my recent studio cleanup. I also mounted my panel inside a foam core holder before attaching it to the panel holder so excess paint would end up there instead of on the wood. Marilyn replied, yes, put the paint right on there and actually USE the Open Box M! After many beautiful paintings, Marilyn's Open Box M looks like this. I am excited to have mine look like Marilyn's but for now you can join me in laughing at myself. 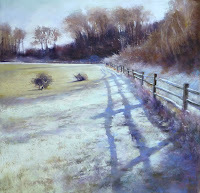 You can see Marilyn's work on her website and blog. As a pastel artist, I'm not used to mixing color so this summer's exploration into oil paint has been fun and challenging. I made these oil color charts 6 years ago and recently rediscovered them during my studio cleanup. I am using them for many color decisions - mixing colors I wouldn't ordinarily use to create subtly varied hues. 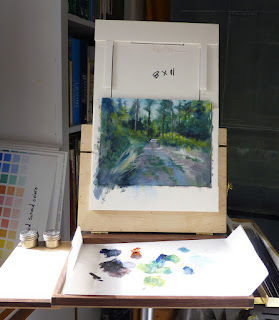 After lots of green in Oil Study #4, I was ready to try a different color palette. Once again, the scene is the off-leash dog park but this time in late summer. Love those grasses! 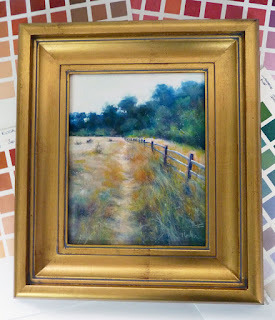 This is the 10 x 8 inch oil color study for a larger painting tentatively titled "Wanderlust." 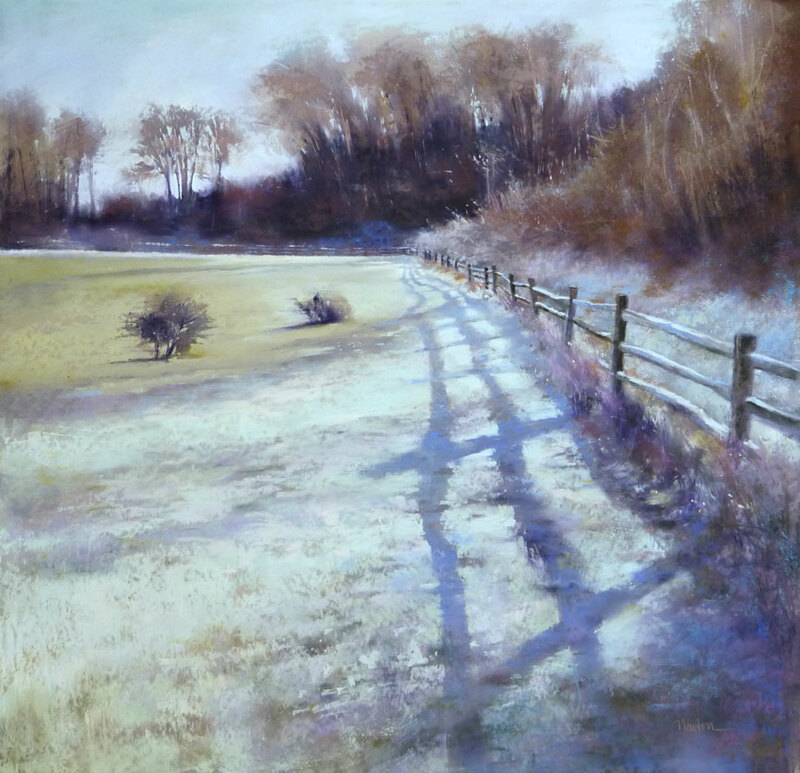 I painted the same scene in pastel, much larger, 25 x 25 inches, earlier this year. See "Heartbreak Morning" below.